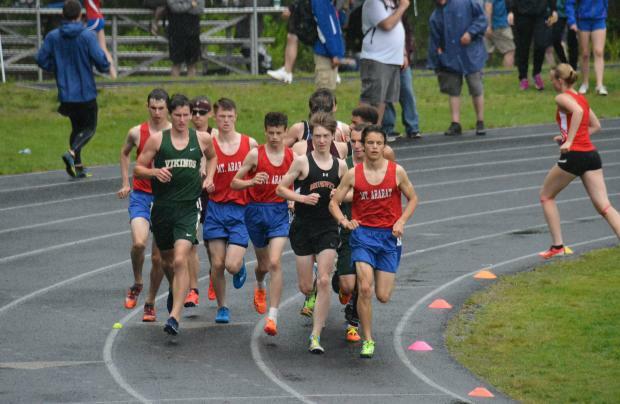 The Edward Little Men's track and field team collected 177 points on their way to a forty point victory over their cross-river rivals, the Lewiston Blue Devils at Mt. Ararat High School in Topsham. It was a swan-song of sorts for the track at Mt. Ararat High School which, after forty-five years, will make way for a new high school soon to be constructed on the site. Once the new school is opened and the current one meets the wrecking ball a new track and playing fields will be built in another location. But for now Mt. Ararat will be without a track. They'll be in good company as tracks throughout the shrinking KVAC Class A are disappearing faster than they can be replaced. There are seven Class A Schools in the KVAC competing in track and field right now. Three of them-Mt. Ararat, Brunswick, and Edward Little-will be without a track that can host a home meet next season. Brunswick and EL continue to use their on site tracks for practice but replacements remain in the planning stages. Here is to the successful completion of the new track at Lewiston High School. 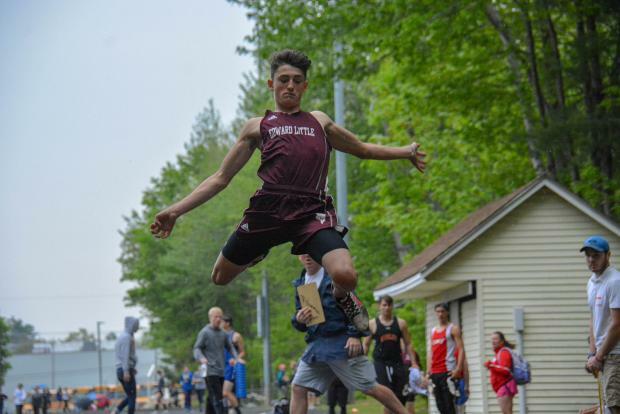 While the men from Mt Ararat did score some good individual victories, the day belonged to Edward Little as the men's team joined the women to sweep the Class A Championships. The Eddies accumulated six individual titles and one relay victory en route to the Championship while the Blue Devils came up with four individual wins and took the other two relays in collecting 137 points. 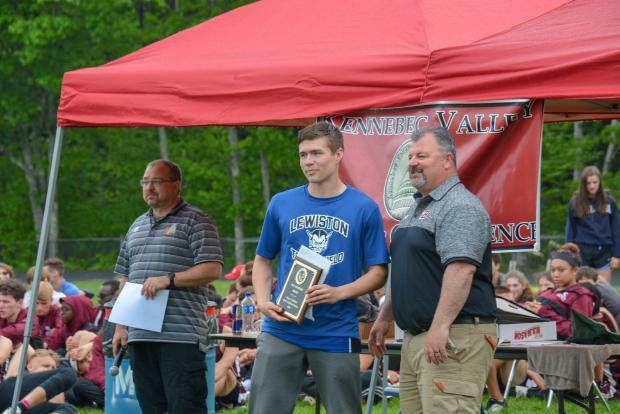 Though they could not claim the title the Blue Devils did take home some hardware as Connor Kaplinger was awarded the Don Matheson Award as the meet's outstanding field athlete. Kaplinger won the discus, was second in the javelin, and place in the shot put. 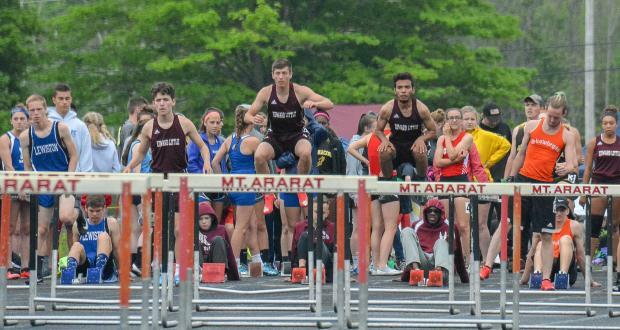 Among the more interesting races were both sets of hurdles races where the question was not whether a Red Eddie would win, but rather which Eddie would cross the line first; in the 110 hurdles where Barrak Abdraba and Connor Jackson have traded first for second all season. As it turned they each got a first and second as Abdraba topped Jackson in the 110 with a time of 15.91 and Jackson returned the favor by taking the 300 in 42.24. In the 110 they had plenty of company as Ben strong pinned down the third spot and Misha Boulet grabbed the sixth position. Jackson's 42.24 in the 300 MH was a new personal best, but he was not done scoring. He took third in the triple jump and second in the high jump with a leap of 6-2. Fabrice Mpoyo, alone on the podium for EL in both the 100 and 200, at least had the pleasure of taking the top spot as he won both events with times of 11.48 and 23.36. Mpoyo also was part of third place 4 x 100 team that included Michael Gary, Jeremy Carter, and the hurdler Barrak Abdraba. But Mpoyo was back on top of the podium at the end of the meet as EL took the 4 x 400; there Mpoyo was joined by Oliver Hall, Russell Allen, and Alex Thompson. Thompson had a good day himself as he claimed the pole vault title (13-0, a new PR) and placed in the long jump and javelin. The final win for the Eddies was from Matt Syphers whose 8:02.45 was tops in the race-walk. Russell Allen and Oliver Hall went two-three in the 800 behind Mt. Ararat's Lisandro Berry-Gaviria. Allen also took second in the 400 while Oliver placed fourth in the 1600. About the only place the Eddies weren't very productive was the throws, even so in addition to Thompson's point for seventh in the javelin, Curtis Ouellete placed fourth in the discus to complete the scoring for EL. In addition to Kaplinger's throwing prowess-he won the discus. (118-10), was second in the javelin, and placed in the shot put-the Blue Devils took thee other individual titles, and two relays. Kaplinger got in on one of the winning relays as he took a leg of the 4 x 100 along with Jeremiah Williams, Lucas Nichols, and Kamundala Crispin. Lucas Nichols also estbalished a new personal best of 19-5.25 as he won the long jump. Kamundala Crispin bounded furthest in the triple (41-07.50) to go with a third place long jump that set a new personal mark. Noor Hussein won the shot put with a personal best of 38-11.50). 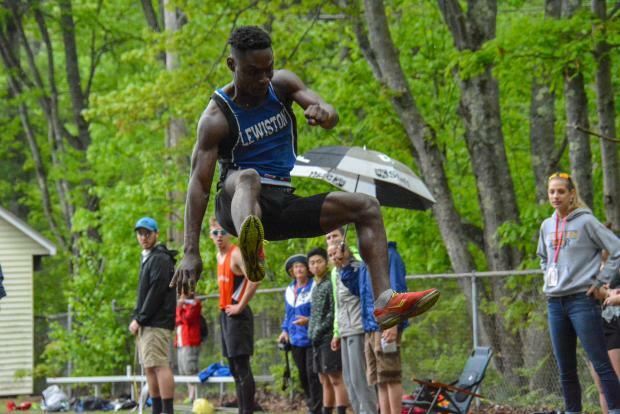 To begin the meet the Blue Devils 4 x 800 team of Gabriel Labonte, Davion Jackson, Maurice Beaulieu and Noor Shidad got Lewiston off on the right foot with a one-second win over Brunswick at 8:34.68. In addition to Berry-Gaviria's win in the 800, the home team got wins from him in the 1600 and 3200. Tyler Bernier also claimed a first for Mt. Ararat with a win in the 400, clocking 51.74. His time, like so many on the day, was a new best mark. 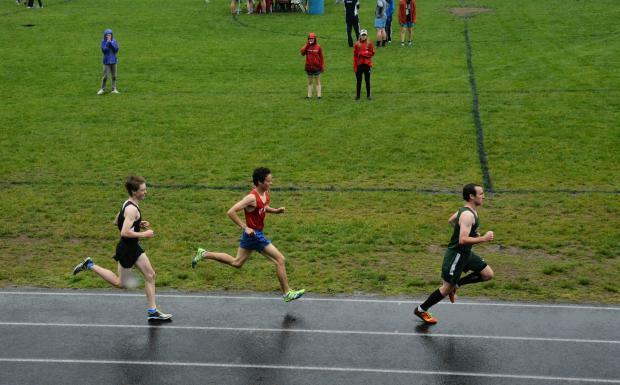 Berry-Gaviria went head-to-head with Oxford Hills's Dom Sclafani in both the 3200 and 1600. Favored to win by four-seconds, Berry Gaviria nearly lost the race by trying to control it early. With three other runners from Mt. Ararat in the race, the Eagles boxed Sclafani in early and ground the pace to what looked like a tight packed tempo run. With runners in front of him shoulder to shoulder and a runner immediately on his right holding Sclafani against the infield Sclafani had no choice but to make a hard turn right and break out of the box to find breathing room. With a little jostling Sclafani ditched his minder and blew past Brunswick's Will Shaughnessy and Berry-Gaviria to take the lead and completely changed the complexion of the race. 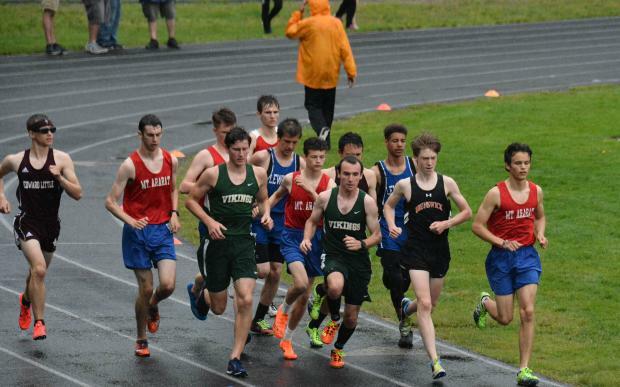 Sclafani led it until the final 200 meters when Berry-Gaviria, working hard, caught up with him and made his pass. Even so Sclafani rebounded and pressured again just after the last curve staying on Berry-Gaviria's shoulder down the homestretch. Berry-Gaviria finished at 4:27.44, while Sclafani was just off that at 4:27.86. Both times were new best marks. The nearest competition was twelve seconds back. Oxford Hills also had a great performance from Dawson Stevens who won the javelin with a throw of 176-01, just a shade off the 177-1 that won him the State championship last spring; Stevens also placed second in the 100 and third in the 200.